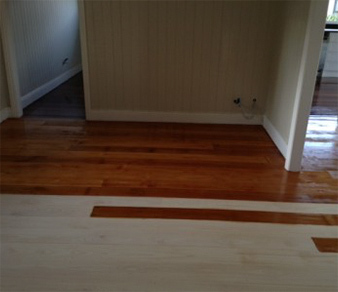 You may remember one of the most recent jobs DR Main Floors undertook at Toowong, which was staining the floors of a room that were mixed with new pine flooring and old floorboards. Attempting to blend the stain so the variance between the different types of floors was a challenge, but it was something we overcame. After the homeowners had been so pleased with the job we did in their living room, the family decided their kitchen and dining floors also needed a refreshment. The floors were finished with a polyurethane gloss finish, which creates the fresh and bright look of any modern home. While many may see this as a downfall, DR Main Floors was able to make it an interesting feature of the room. All of this, including the sanding of the flooring and polishing, took just three days to complete with minimal fuss caused. This was just another excellent job completed by DR Mains Floors and exemplifies the diversity of needs we can meet.